29 Hereford is located on the west side of Hereford, between Marlborough and Commonwealth, with 27 Hereford to the north and 31 Hereford to the south. 29 Hereford was designed by Alfred S. Bither, architect, and built in 1879 by Goldthwait & Chapin, masons, for building contractor Samuel Tarbell Ames, one of four contiguous houses (364 Marlborough and 27-29-31 Hereford). He is shown as the owner on the original building permit application, dated March 27, 1879. Samuel Ames built the houses for wire and cable manufacturer Charles Anthony Morss, for speculative sale. 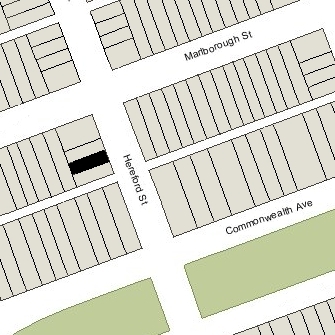 He and his wife, Mary Elizabeth (Wells) Morss, lived at 323 Marlborough. Click here for an index to the deeds for 29 Hereford, and click here for further information on the land on the south side of Marlborough between Hereford and Massachusetts Avenue. On October 8, 1879, 29 Hereford and 31 Hereford were purchased from Charles Morss by real estate dealer Samuel Horatio Whitwell. On November 4, 1879, 29 Hereford was acquired from Samuel H. Whitwell by McPherson Le Moyne, a merchant. He and his wife, Mary Brooks (Brigham) Le Moyne, made it their home. They continued to live there during the 1883-1884 winter season, but moved thereafter to Brookline. On July 10, 1884, 29 Hereford was purchased from McPherson Le Moyne by Annah J. W. (Lovering) Curtis, the widow of Dr. Thomas Buckminster Curtis, Jr., a physician. She previously had lived at 191 Beacon. During the 1886-1887 and 1887-1888 winter seasons, she was living elsewhere, probably traveling abroad, and 29 Hereford was the home of real estate broker Thomas Nelson and his wife, Annie (Bigelow) Nelson. They previously had lived at 18 Fairfield. By 1889, they had moved to 166 Marlborough, and 29 Hereford was once again Mrs. Curtis’s home. 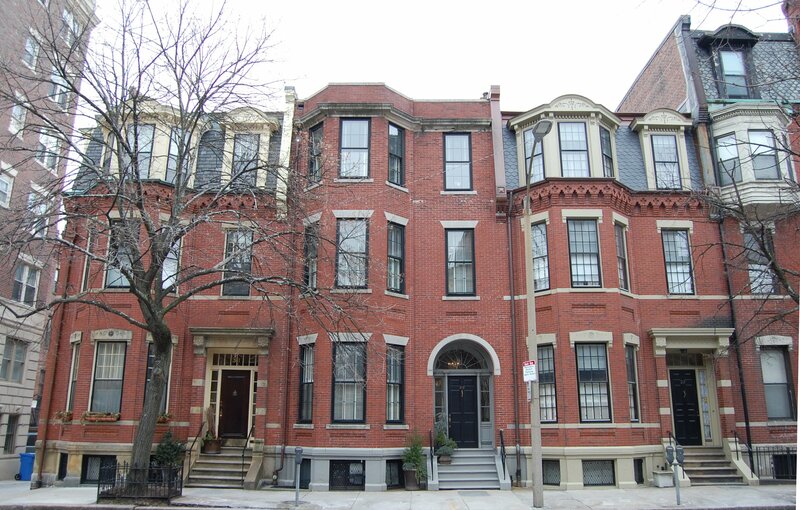 During the 1891-1892 winter season, she was again living elsewhere and 29 Hereford was the home of James Jackson Storrow, Jr., and his wife Helen (Osborne) Storrow. They had married in October of 1891 and 29 Hereford probably was their first home together. James Storrow was an attorney and later would become an investment banker. 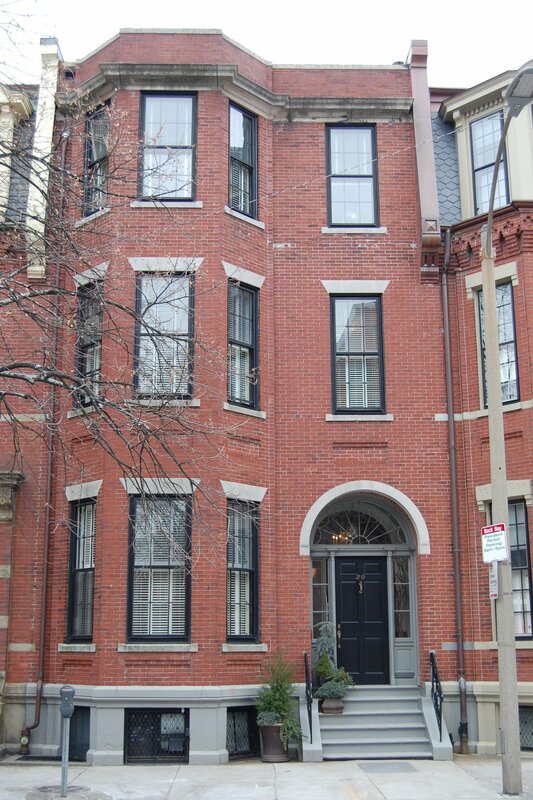 By 1893, the Storrows had moved to 419 Beacon and 29 Hereford was once again the home of Annah Curtis. She remarried in February of 1894 to Henry E. Howland, an attorney and judge from New York City. where they lived after their marriage. On May 15, 1894, 29 Hereford was purchased from Annah Howland by Anna Huidekoper (Peabody) Bellows, the widow of Rev. Henry Whitney Bellows. She previously had lived at 12 West Cedar. Henry Whitney Bellows had been pastor of All Souls Church in New York City and an organizer of the National Conference of Unitarians. He had died in January of 1882. Henry and Anna Bellows’s two surviving children, Robert Peabody Bellows, an architect, and Ellen Derby Bellows, lived with her. Ellen Bellows married in April of 1905 to Dr. Samuel Robinson, a physician, and they moved to an apartment at 416 Marlborough. Prior to their marriage, he had lived at 169 Beacon. They later divorced and she remarried in 1928 to retired advertising executive Thorndike Howe Endicott. After their marriage, they lived at 31 Hereford. Anna Bellows continued to live at 29 Hereford until her death in March of 1920. Robert Bellows continued to live with her. William Truman Aldrich, his partner in the firm of Bellows and Aldrich, lived at 31 Hereford. After his mother’s death, Robert Bellows moved to 8 Park. On June 7, 1921, Anna Bellows’s estate transferred 29 Hereford to Robert Bellows. During the 1921-1922 winter season, 29 Hereford was the home of Charles Edward Inches, Jr., and his wife, Margaret (Carter) Inches. In 1920, they had lived in Brookline. He was assistant treasurer of several textile mills. They continued to live at 29 Hereford during the next season, but moved thereafter to his family home at 386 Beacon. On July 31, 1922, 29 Hereford was acquired from Robert Bellows by Parker Williams Whittemore. He and his wife, Grace Jones (Sinclair) Whittemore, made it their home. They previously had lived in West Gloucester. Parker Whittemore was a retired manufacturer of railroad cars. In August of 1922, he applied for (and subsequently received) permission “to remove old mansard roof and carry brick front up to present roof.” The remodeling was designed by architect William W. Dinsmoor. 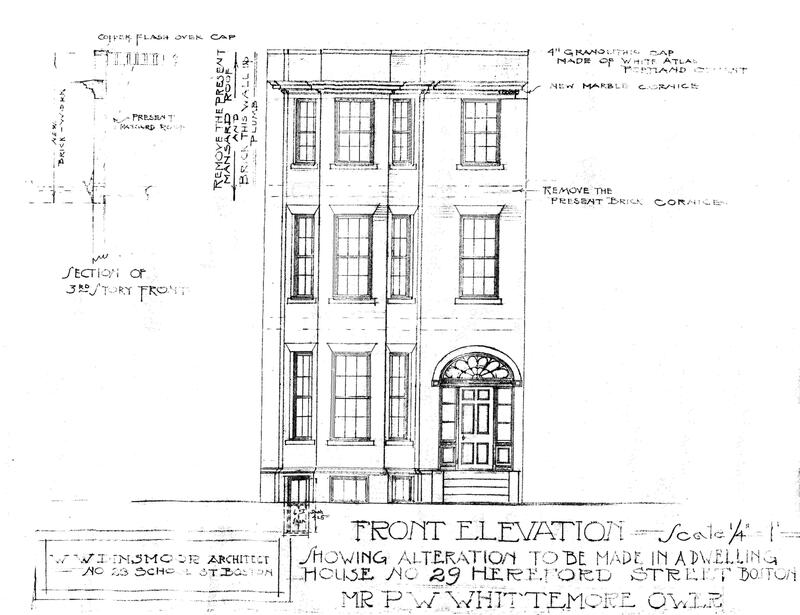 Plans for the remodeling — including a front elevation and floor plans — are included in the City of Boston Blueprints Collection in the Boston Public Library’s Arts Department (reference BIN G-49). The Whittemores continued to live there during the 1924-1925 winter season, but moved thereafter to 5 River. During the 1925-1926 winter season, 29 Hereford may have been the home of attorney Charles Cobb Walker and his wife, Helene (Whitehouse) Walker. Their usual residence was at 7 Arlington, where they also were listed in the 1926 Blue Book. At this time, they were engaged in divorce proceedings and 29 Hereford may have been Helene Walker’s separate residence. They are listed as a couple in the 1926 Blue Book, but only Helene Walker is listed in the 1926 List of Residents (along with a cook and two nurses, presumably for the care of their infant son, William). On August 31, 1926, 29 Hereford was acquired from Parker Whittemore by Earle I. Brown. The property subsequently changed hands and on May 19, 1927, was acquired by Alice Hathaway (Haskell) Burrage, the wife of Albert Cameron Burrage. They lived at 314 Commonwealth. She purchased 29 Hereford as trustee for the benefit of their son, Albert, Jr.
By the 1926-1927 winter season, 29 Hereford was the home of Albert Cameron Burrage, Jr., and his wife, Anne Bell (Shirk) Burrage. They also maintained a home at Ipswich, Candlewood Farm, which previously had been their year-round residence. He was an engineer and copper mining executive affilated with companies developed by his father. Like his father, he was an avid horticulturalist and in 1954 published Burrage on Vegetables about the growing of vegetables. Albert and Anne Burrage continued to live at 29 Hereford until about 1946. By 1946, 29 Hereford was the home of George Layng Pew and his wife, Catherine McCormick (Ansbach) Pew. They continued to live there until about 1949. Alice (Haskell) Burrage had died in December of 1947 and 29 Hereford had continued to be owned by the trust established for her son’s benefit. On September 30, 1949, it was purchased from the trust by Solomon Abend, and on October 4, 1949, it was acquired from him by Gladys (Lawson) Stanwood French, the widow of Eben Blaine Stanwood and of Philip French. She previously had lived at 31 Fairfield. In December of 1949, Gladys French applied for (and subsequently received) permission to change the occupancy from a single-family dwelling to a lodging house. She continued to live and operate a lodging house at 29 Hereford until shortly before her death in April of 1961. On August 24, 1960, 29 Hereford was acquired from Gladys French by Miss Josephine Mary Ward. Her mother, Ellen M. (Brennan) Ward, the widow of Philip Walter Ward, lived with her. Also living with her was Miss Helen Bridget Walsh. They all previously had lived at 262 Commonwealth, where Josephine Ward had operated a lodging house. That same month, Josephine Ward filed for (and subsequently received) permission to convert 29 Hereford from a single-family dwelling into a two-family dwelling (the previous approval converting the property into a lodging house appears to have been overlooked). Josephine Ward, Ellen Ward, and Helen Walsh moved 1961 to Gloucester, where they were living at the time of Ellen Ward’s death in November of 1963. On August 31, 1961, 29 Hereford was acquired from Josephine Ward by Robert E. Foster and his wife, Joan B. Foster. They previously had lived in West Roxbury. He was a real estate appraiser. In August of 1977, they filed for (and subsequently received) permission to legalize the occupancy as four apartments, which they indicated was the existing condition. The Fosters lived in one of the apartments until the late 1970s, when they moved to Brookline. On October 6, 1978, 29 Hereford was acquired form the Fosters by Kevin J. Ahearn, trustee of the 29 Hereford Street Realty Trust. The property changed hands. The legal occupancy remained four apartments, but by 1984, it was assessed as a three-family dwelling, and by 1998 as a two-family dwelling. On January 23, 2003, 29 Hereford was acquired by Victoria (Gifford) Kennedy, the widow of Michael LeMoyne Kennedy (the son of former Attorney General Robert Kennedy). On October 19, 2005, 29 Hereford was acquired from Victoria (Gifford) Kennedy by George W. Fink and his wife, Sherry A. Robinson. In March of 2006, Sherry Robinson applied for (and subsequently received) permission to remodel the interior. The legal occupancy of the property remained four apartments; however, from 2007, it was assessed as a single-family dwelling. The property changed hands. It remained assessed as a single-family dwelling in 2017.